“I prefer Newt. Hey what’s that?” he asks, pointing to my microwave. OK, after the initial enjoyment of explaining all the recent technology to a genius wears off, the real fun would begin. Newton was a crazy MoFo. When he didn’t think math was comprehensive enough he invented calculus! Who does that? But since he thought it would be too boring a subject (that’s my interpretation), he kept it a secret for 27 years. He learned Hebrew because he thought he could decipher clues as to the second coming of Christ. He was obsessed with figuring out how to turn base metals into precious metals. I just imagine him staring at his fork during dinner, willing it to turn to gold. It would give Louie CK a lot of great material. I’ve watched many things fall without having a single intelligent thought. Newton observes an apple falling and suddenly our whole world makes a lot more sense. We understand why things move or don’t move because of him and his three laws. He gave us the reflective microscope and the color and light theory. The least I could do is invite him over for dinner. I would serve him Turducken, baked apple and wine, and as I said before, he’ll sit next to Louie CK. 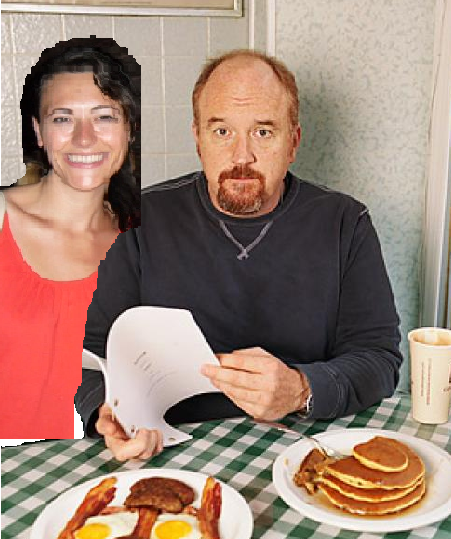 My dinner party with 5 famous people: #2 Louie C.K. As I wrote in my last post, I’ve decided to take a cue from the classic college application question: If you could have dinner with five famous people (alive or dead) who would they be and why? It’s a good question because it shows what you value in a person, and what you hope to gain from the interaction. So without further ado, here’s the second person I would invite: Louie CK. 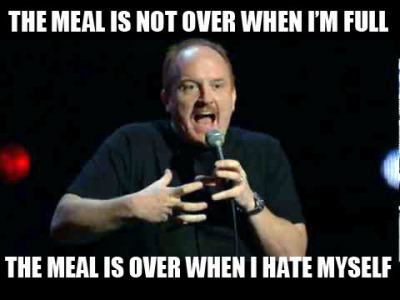 I was pretty late to discovering the comic genius that is Louie CK. I kept hearing his name mentioned, and sometimes when someone would say “you know, like on Louie,” I would smile and nod, having no idea what they were talking about. Netflix had been suggesting his show for months, and finally one day I plugged my computer into the t.v. and sat down to watch the show. By the next day (embarrassing to admit) I was done with season one and ready for more. For the next 5 posts, I’ve decided to take a cue from the classic college application question: If you could have dinner with five famous people (alive or dead) who would they be and why? It’s a good question because it shows what you value in a person, and what you hope to gain from the interaction. So without further ado, the first person who came to mind was Oprah Winfrey. Oprah introduced me to author’s I love (Jonathan Franzen , Isabel Allende , and Barbara Kingsolver to name a few), causes I care deeply about (The Fistula Foundation, Puppies behind bars, and The Grameen Bank to name a few), and questions of spirituality that I still grapple with. She asked questions and we all got to listen to the answers. 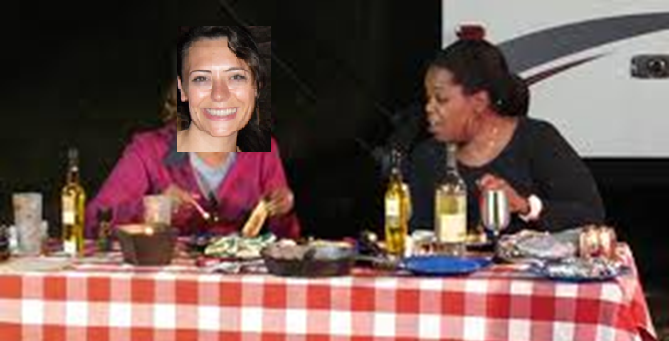 I would want Oprah to relax at the dinner party. No toasts, no stories, no pressure. She’s worked hard her whole life entertaining and challenging us that all I would really want is for her to sit, drink some wine, and receive a big fat hug from me at the end of dinner.